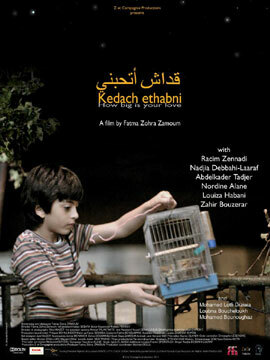 AFRICAN WOMEN IN CINEMA BLOG: Fatma Zohra Zamoum: Kedach ethabni | How Big Is Your Love? Fatma Zohra Zamoum: Kedach ethabni | How Big Is Your Love? Fatma Zohra Zamoum discusses her film Kedach ethabni | How Big Is Your Love? (201s) which examines love, tradition and modernity through the lives of a three-generation Algiers family. Fatma Zohra, through Adel and the world that surrounds him, your film examines tradition and modernity within an intergenerational context. Talk a bit about your interest in dealing with this theme and your approach. Tradition and modernity are not historical periods separated and compartmentalised in the lives of individuals or societies outside of the West (seen in Japan or other cultures). In each individual there are progressive and reactionary aspects. Everyone does his own synthesis of tradition or has her own way of being modern. It is this complexity in individuals and in societal dynamics that interests me. The critical level that some societies reach before addressing the demands of compliance (to tradition) are embedded in social, religious, cultural practices and even fads. I wanted to deal with this in the present context of a three-generation middle-class Algiers family. And it is above all, about feelings, sharing, and communicating among individuals of the same family. Yes, the title of the film presents the intentions of the film itself: the question of love. This question, posed between adults and children, is a bit of a ritual in Algerian society. It indicates the strength of their bond but also the need to build it. The film’s intention is to see this love grow between child and grandmother during the film. There are other romantic relationships in varying stages: the love that ends between the child’s parents, the love that begins between the two young neighbors, and the love that is built throughout time between the grandparents based on a system of reason or of necessity, etc. Your portrait of the grandmother Khadidja and the neighbor Farida, is it a feminist gaze on the two generations of women? Yes, most certainly. I am very interested in female characters and the complexity of their inner lives. I admire a great deal, though not understanding it, the immense availability that some women have for their families, such as the grandmother Khadidja, as well as my mother, and other women of that generation who are now in their seventies. 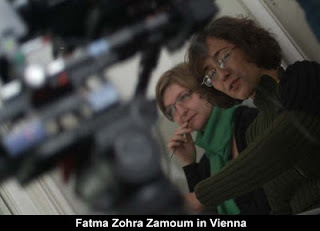 As for Farida, she is a young woman in her twenties who lived during the dark decade of Algeria without understanding it. She deals with the codes and constraints that emerged during that period (a new form of religiosity or its manifestation). She deals with her burgeoning love affairs and her desire for freedom but at the same time she learns things from Khadidja in order to envision a future (an ellipsis in the film). The relationship between Khadidja and Farida is initially based on their relationship as neighbors, but transforms with the arrival of Adel and the changes that Khadidja makes in her life as her love for him deepens. How was the film shooting, your experiences with the actors and on location in general? The film shoot was rather difficult in terms of shooting during five weeks with a child as the main character as well as older people. But it was great from the point of view of working with very talented actors and a close-knit and very professional crew. The fact that I was both director and producer was a tremendously exhausting workload. Though there was no other choice. That was how it had to be or otherwise it would not have been possible. There were some incredible moments but because I was so busy directing and producing I was not able to share them with the crew. I was not able to enjoy the moment and even during the festivals it was the same thing, too much work tied to the distribution of the film. Well, that’s the way it is! And the audience response? In Algeria and elsewhere? Everywhere the audience reception was fantastic. The film was embraced as a story that speaks of a neighbor or of oneself. Everywhere, in Palm Springs, as well as in Tubingen and in Saint-Denis, the viewers liked the characters and understood their problems. It was truly a cause for satisfaction. The film will open this week in Algeria and I am excited about meeting with the audience. Aside from those who may feel that it is too long or for those who may think that the subject is too obvious, almost familial, the preview has already been received with much enthusiasm.